...how much is 7 squared? 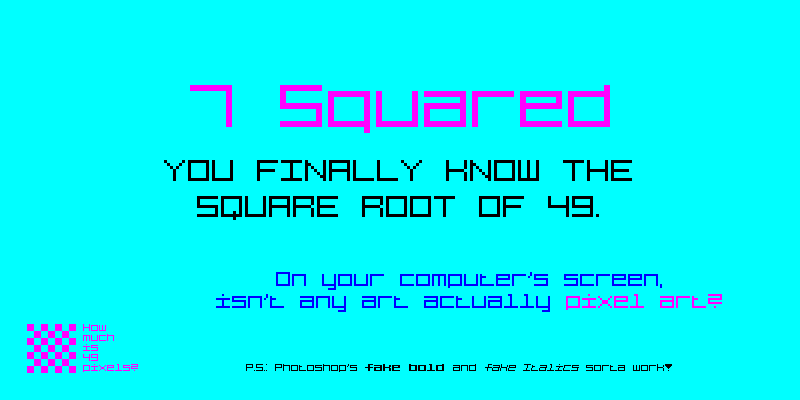 7 Squared is a retro bitmap pixel font, with most characters based on a 7x7 square of pixels. It features both lowercase and uppercase letters and has all the special characters in the Google Fonts standard, including some of the extended Latin letters, check out the character chart! Note: The font is made of pixels, which may get messed up in low resolutions or pixel art. For correct display, you should use text sizes divisible by 9 (the font’s height is actually 9p, not 7, due to diacritics), as 9, 18, 27, 36... you get it.